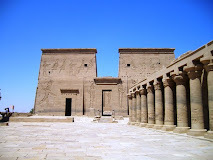 The Beshtak Palace is a notable stop for tourists because of its museum which documents the history of the city of Cairo, and its beautiful Qaa (chamber). On the outside, this palace built by Emir Beshtak in 1334, has unusual windows screened with mashrabiya. But the second floor chamber, with its pointed arches, stained-glass windows and gilt and painted wood paneling distinguish it as one of the most beautiful private chambers of the period.